In a windowless room on Raytheon’s campus in McKinney, Texas, a small team of blue jean-clad engineers and physicists is doing something that’s never been done before. They move back and forth between computer screens and a vehicle that looks like it’s straight out of Mad Max. 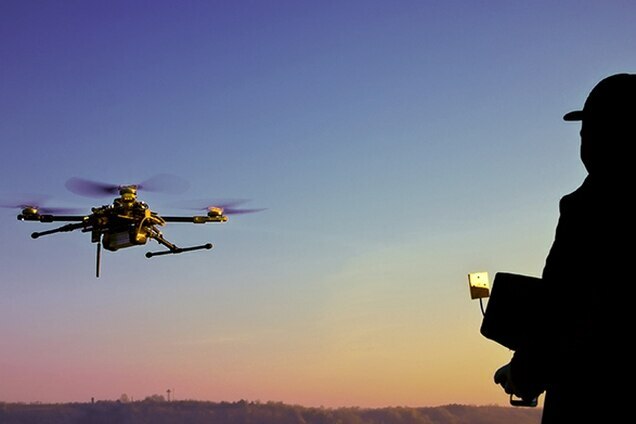 “Basically, we’re putting a laser on a dune buggy to knock drones out of the sky,” said Dr. Ben Allison, director of Raytheon’s high energy laser product line. It’s actually a little more complicated than that, Allison added. 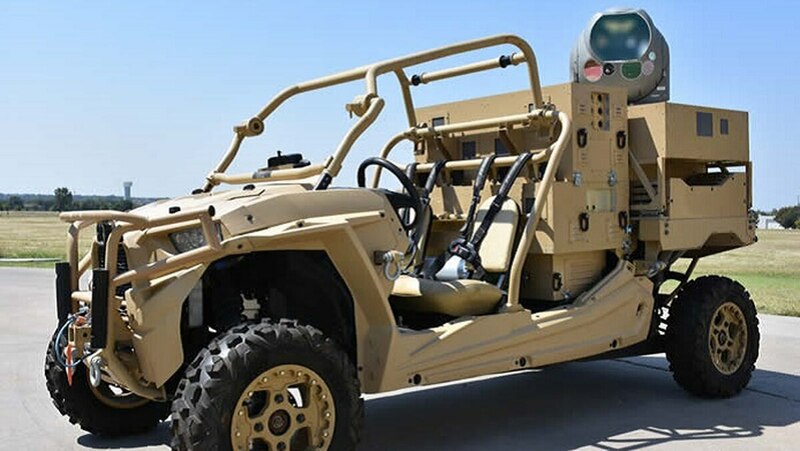 The team is combining a high energy laser with an advanced variant of Raytheon’s Multi-spectral Targeting System – a sophisticated package of electro-optical and infrared sensors – and installing it on a Polaris MRZR, a small, all-terrain vehicle. According to Allison, the idea grew out of a meeting with Raytheon’s CEO and Chairman Tom Kennedy earlier this year. Kennedy told Allison and Morrish that an allied nation had recently used a Patriot missile to shoot down a cheap, store-bought UAS that was outfitted with a grenade-like munition. 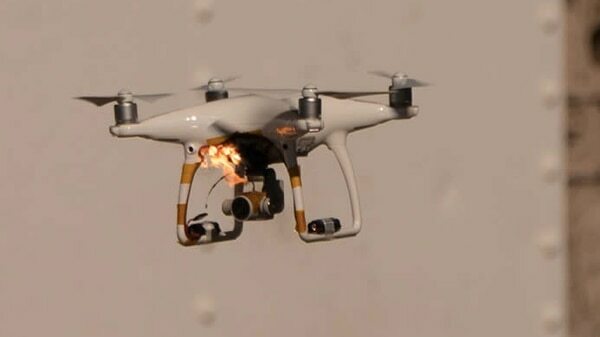 Raytheon targeted and disabled a small Unmanned Aerial Vehicle using its High Energy Laser Weapon System onboard a Polaris MRZR in New Mexico. The team first looked at putting its laser on a standard-size military container, but soon realized it only took up a quarter of the available space. 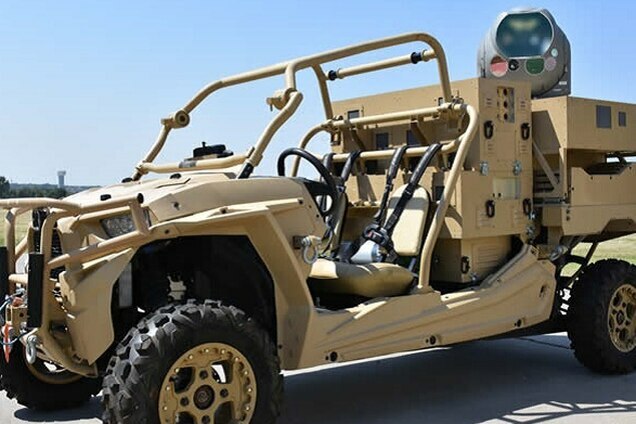 At the same time, an undisclosed customer was exploring ways to put a laser weapon system on vehicles small enough to fit in an airplane’s cargo bay or inside a helicopter. “When we saw how small we could make it and we saw a clear customer need, we immediately wanted to find a very tactically relevant vehicle that could get out to forward operating bases and do its mission,” said Allison. The system is standalone, with a footprint of roughly 30 square feet. On a single charge from a standard 220v outlet, the same kind you plug your washing machine into at home, the HEL system onboard the MRZR delivers four hours of intelligence, surveillance and reconnaissance capability and 20 to 30 laser shots. The system can also be coupled with a generator to provide virtually infinite magazine depth. While the laser and the vehicle are sure to draw all the attention, it’s the weaponized MTS sensor package that is the core of the system. In this configuration, the MTS provides its standard setting ISR and tracking capabilities while also serving as a beam director. That’s something Allison says sets this combo apart from bigger, more power-hungry systems. “If you have a good beam director, then you can use a smaller, more efficient laser. You can make your system smaller and more flexible,” said Allison. Morrish believes the solution is particularly suited for expeditionary missions. Raytheon began field testing the HELWS MRZR last week, and is slated to demonstrate it at the U.S. Army’s Maneuver Fires Experiment at Fort Sill, Oklahoma, in December. This article was produced by the creative services department of Army Times in collaboration with Raytheon. The Army Times newsroom was not involved in its production.